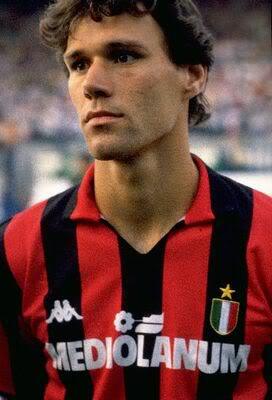 Marco Van Basten is just one of many to graduate from the Dutch pipeline of talent. It is no secret that the Netherlands are known as one of the driving forces in world football as we build up to the 2012 UEFA European Championship. Their dominance comes with the flamboyant elegance of their ‘total football’ style and it is showing no signs of stopping anytime soon. Oranje have just won UEFA European Under 17 Championship final in Slovenia, contesting the penultimate showdown against an equally impressive Germany side that failed to concede a single goal throughout the tournament’s group and knockout phase. It was evident that these two sides would be challenging the final from the moment they kicked off the 10th edition of the tournament, since it changed from the Under 16 format. The final turned out to be a very close encounter. After Germany took the lead just after half-time from Leon Goretzka’s header, Elton Acolatse found a later equaliser to send the tie into extra-time and penalties. Netherlands came out on top as Marc Stendera saw his penalty saved and they won 5-4 in the shootout. The tight nature of the game was typical of the tournament that these two sides have had and the players that have been on display for both teams. Apart from the legacy of the Spanish, these two sides have dictated European youth football for the past few years and that continuous supremacy shows no signs of cessation. Highlighted by the fact that the 2011 and 2009 European Under 17 Championship final included both of these sides, with Netherlands victorious in 2011 and Germany triumphant in 2009, the continent will be shaking in fear of facing these potential outfits in a four years or so time. But what are they doing that is so different from the rest of us? Apart from the prestigious Ajax Academy, Netherland’s doesn’t seem to have any stand-out factors that should make it seem better than everyone else, do they? Johan Cruyff, Marco van Basten, Dennis Bergkamp and Ruud Gullit have all graduated from the Dutch academy ranks and led their country to extraordinary glory in the past few decades and a new crop of world-beaters are just on the horizon. Rai Vloet, Nathan Ake, Tonny Trinidade de Vilhena and Thom Haye have all produced consistently outstanding performances throughout the tournament for Albert Stuivenberg’s team that had seen them reach the final with ease. All four have linked up luminously to become the catalyst of intelligent movement, undisturbed possession and an abundance of goals for Oranje in the five matches that led them to the title – and that sums up where they come from, what they’ve been taught and now what they will bring into the lengthy and bright future they have ahead of them. It is common to see your frequent 4-4-2 system being played throughout clubs in England, but in Holland they actively encourage playing a 4-3-3 formation and make training sessions about enjoyment rather than pressure to move on to the next level. They believe in keeping possession to create opportunities but to always move in an attacking way – backwards does not exist here. There is a lot of pressure in England to win, whereas in Holland there seems to be no signs of a direct winning mentality, only the pleasure of playing the game which ultimately brings with it an attitude for success. This indirect way of winning is as apparent off the pitch as it is on it, the country focuses on rich facilities and invests a vast amount of money into amateur clubs to make them the focal point of the community. Following the introduction of the model in 2002 by Louis van Gaal on behalf of the Dutch FA (KNVB), it may be surprising to know that only 36 clubs in Holland are officially professional, but a further 2,700 amateur sides benefit from the KNVB’s £1billion investment every year. Despite this huge contrast in money and numbers from England, the relationship between professional and amateur sides is much closer with regular games between the sides across all levels. Netherland’s celebrate this week’s European under 17 Championship win. In England, grassroots football can only hope to benefit from a fraction of that investment. The Premier League contributes £43.4m to grassroots football (less than 5% of it’s TV rights deal) and even though the FA stated in 2000 that they would contribute £20m per annum to grassroots football in the country, they only paid £12m in 2010. Another factor in their success could be the uninterrupted commitment of the community towards developing youth football in the country, which is nothing short of admirable. The KNVB has 1.2m members – 7% of the Dutch population. This lack of investment and enthusiasm for the grassroots game in England leads to poor facilities, which means that the top coaches and players will lack the motivation to get the best out of themselves or their players when it comes to developing them into world-class talent. A typical amateur side in Holland has warm changing rooms, floodlit artificial pitches, spacious clubhouses and a dedicated medical centre which is ran by approximately 100 community volunteers. A typical amateur club in England is lucky to have hot showers. The facilities are impressive but it is the consistency of those that makes it evident why Holland are currently ranked fourth in the FIFA World Rankings. Every one of those 2,700 amateur sides has their own academy with equally impressive amenities. It seems the only way is up. After securing and now maintaining this state-of-the-art platform for development, the Dutch are now focusing on tactics more than the technical side of the game that will keep them as a major force in world competitions for many years to come. England – be very, very scared. Hi Tom, interesting read, this site of yours. Keep it up. What do Robin van Persie, Luc Castaignos, Leroy Fer, Georginio Wijnaldum, Kyle Ebecilio, Karim Rekik, Nathan Ake, Tony Trindade de Vilhena, Tim Krul, Patrick van Aanholt, Anass Achabar and Jeffrey Bruma all have in common…? A clue: it isn’t Ajax. There is a talent factory in The Netherlands that has been producing quality players by the dozens in the past years due to diligent, long-term vision and strategy. While the financial hardships of the associated professional club has caused great premature outflow of players, they are now starting to pay back in recognition and attention for the academy that they attended. A team with 6 players from it’s own system came in 2nd last season, bettering the season before by 8 places. Admittedly, John Guidetti had something to do with it as well. I have all but answered the question myself by now. Consider this post a product of new-found confidence. Pride never waned. Sorry, I should not have mentioned Patrick van Aanholt, he is courtesy of PSV Eindhoven.